John Harper was initially trained in Dunedin after completing a BSc in organic chemistry. He then established a conservation department at the McDougall Art Gallery before two further years of study at the Canadian Conservation Institute in Ottawa, Canada, and the Tate Gallery in London. 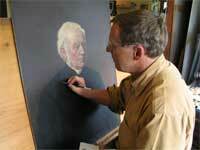 He then worked as a paintings conservator for two years at the National Art Gallery in Wellington. As a founding member of the New Zealand Professional Conservators Group (NZPCG), John adheres to its code of ethics. He regularly attends the biennial conference of the Painting Conservators Group in Australia’s AICCM. He also keeps up-to-date by attending workshops and conferences both here and overseas. With over twenty years in private practice, John has gained a wide experience in all treatments of acrylic and oil paintings.